Welcome to Noongar Country! 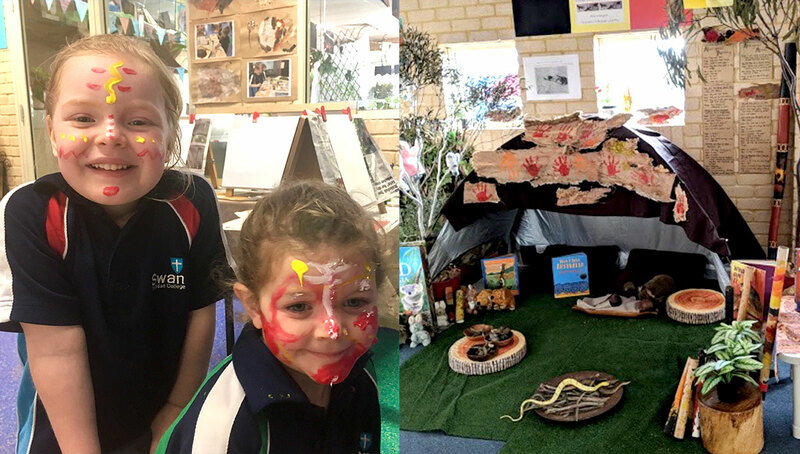 The Kindergarten students have been immersed in Aboriginal culture in recent weeks. They are exploring the diversity of cultures in Australia and how to respond with respect. Kindy B has investigated what the Aborigines used to paint with and the types of pictures they painted. These pictures tell us about the food they ate and the animals and plants that were important to them. There’s a Mia Mia in Kindy B! It is like a cave and has painted handprints on its rockface. A large part of the Aboriginal culture is to listen to the sounds of nature all around them and they put these sounds into the music of the Didgeridoo and tapping sticks. Didgeridoos are made using logs that were eaten out by termites and then painted using symbols of animals and places that are important to each individual tribe. We have made our own little Didgeridoos and we have left them in our Mia Mia ready to play. The students learned that there were over 500 tribes in Australia and each one had a different language. So how did they talk to each other? Story Stones of course! These stones had symbols painted onto them indicating animals, plants, lizard burrows etc. They could even tell other people where waterholes were! Kindy B would like to thank Mr Calum Kelly, Kaydence, Savahna and Nanna MK for all their help in learning about the Aboriginal people. They have passed on so much cultural information to us and have been a wonderful source of knowledge. We respect the immense amount of knowledge the Aboriginal people have of the land of Australia and are thankful we can all share it together. Now we want to know how Aborigines could travel in the dark because of course they didn’t have any torches!! So many questions…..so much to find out!